Reagan slept really well last night...not waking til after 10am this morning. Very nice. I can handle that. Today she's been in a wonderful mood again. Happy and laughing all day long. My mom flew in this afternoon and tonight she watched Reagan while Mike and I had another date night. Two nights out in two weeks, that's really good for us. We went to one of those movie theaters where you can order dinner during the movie. It was our first movie in almost 6yrs. Sad, I know. We saw Avatar in 3D...it was pretty neat. I hadn't really paid any attention to the hoopla surrounding the movie, so I had no clue what it was about. It turned out to be very entertaining and it was nice that we were able to have dinner at the same time. Reagan was a total angel while we were gone. No surprise there. She has been in a great mood the last couple days. Maybe she's glad that she can finally go to the bathroom again (although she has been having more than her fair share of dirty diapers...not sure what that's about). I think it's more likely that the antibiotic did what it was supposed to do (stopping her sore throat and ear ache) and that her tummy healed up so quickly. Poor thing. Had so many different issues all going on at the same time. Sure makes you thankful for the good days! Reagan finally slept and slept well last night. She went to bed around 11pm and didn't wake til 9am...soooo nice! I hope this is the sign of good things to come. Her mood also seemed improved today. I gave her some Gas X in through her g-button to help break up the foam and I think it worked. She had much less foam come out when we vented her and she also seemed less nauseous today. The area around her gj-button also looks great! We love our pediatrician but I'm glad we listened to another mother whose been there and done that and knew exactly how to treat granulation tissue. We put the 0.1% Triamcinolone cream on it and by the next day it had formed a scab and was healing. The very next day the scab fell off and it looks as good as new! She's also having wet (and dirty) diapers again on her own. I think she's just got to be feeling so much better now. We finally saw some laughter again. When she started feeling sick, the laughter all but disappeared, but tonight it was back in full force. What's interesting is that in all of Reagan's almost 3yrs, she rarely if ever laughed. She'd smile no problem, but no real laughter, certainly nothing like we're seeing now (see video below from last weekend...make sure to pause the blog music so you can hear her). We love it. I think you'll love it too. Please continue to keep our little one in your prayers! Reagan slept through til 5am this morning (waking with a pee/poop diaper). I was pretty happy about that considering the past few nights she was waking every hour or so. Unfortunately she was very, very gaggy. She finally drifted back off to sleep around 7am and we both slept til 9:30 (she on her mat on the floor and me on the sofa). She's been pretty nauseous most of the day. There was one brief period where she seemed to be getting better but we think it was because her pump was malfunctioning/clogged and she wasn't getting any food (and we didn't figure it out til a few hours later). I spoke to her pediatrician who suggested trying 1/2 phenegran suppository. We tried it tonight and it seemed to help a little, but she still retched off and on. Poor thing. Tummy is still full of foam. I spoke to her GI doc who recommended trying Mylecon (or Gas X) to try to break down the gas. I'm definitely planning on trying that tomorrow. She also said that maybe we could try the Periactin again, only at an even lower dose (1/4 tsp instead of 1/2). Worth a shot, but we're going to wait until she's peeing on a more regular basis. Tonight we had an impromptu prayer session at our house for Reagan (and for us). All the women from our Bible study came over and two women from church who have also been praying for Reagan (sorry Mike...all the husbands stayed behind with the kids). It was very touching. It served as a reminder of how many people (many of which we don't even really know) go way out of their way to pray for our daughter on a daily basis. It's amazing. We are certainly blessed. Things have been difficult this week (and these past few months) but we need to just give it up and put it all in His hands. And that's what we'll do. 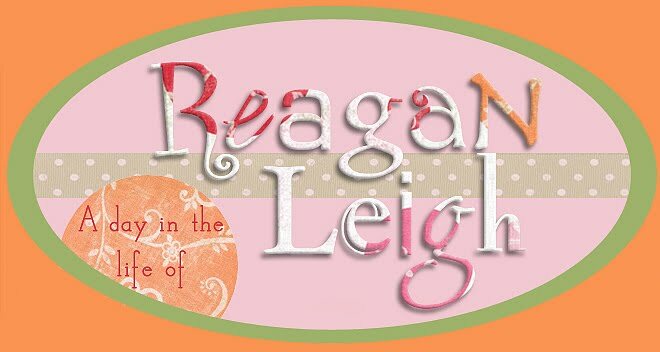 Please continue to keep Reagan (and her parents) in your prayers...we appreciate it more than you'll ever know. Reagan looking super cute sitting up in her chair like a big girl. Sore throat, sore tummy, ear infection, and catheterization...oh my! Last night was rough. Reagan was up and down all night long. No one got any real sleep whatsoever. Today she's been less sleepy than yesterday but still very agitated and moany groany. As of last night she still had not had a wet diaper, so I gave her lasix twice and nothing! This morning started off with a trip in to the pediatrician to get cathed. When they did it very little urine even came out but minutes later she soaked through a diaper, clothes, and the exam table. Poor thing, she had more urine in there than I would even think possible. Hopefully she'll start going again on her own. So far, nothing yet and it's already 11pm. Prayers for a wet diaper in the morning...I sure don't want to have to take her in again for that. While we were there the doctor checked out her throat (still very red) and her ears and bingo an ear infection in her right ear! Reagan's never had one before so I was really shocked. Good thing we started that antibiotic yesterday, it should cover both strep and an ear infection. We also got some cream to put around her gj-tube. Two creams one an antibiotic Bactroban and one a steriod Triamcinolone. The pediatrician really wanted us to try the antibiotic first (which we did) but I was told that the Triamcinolone cream is the way to go so we also used some of that tonight. She's really been reaching for her button all day today. I think it's really bothering her, so hopefully this cream will help. So much stuff going on and no way of knowing what exactly it is that's bothering her so much. It's just so stressful. I think that combined with no sleep has really put me over the edge today. I hope that the antibiotic will take effect and ease the pain that I'm sure is coming from both her ear and her throat. She's been one miserable little girl today (again). Prayers for a much better day tomorrow with less crying (from both of us) and less pain. Last night everything seemed well enough. Reagan was still tense and doing a lot of the movements when I put her to bed. I was hoping she'd just drift off to sleep once in a dark, soothing environment. Didn't happen. I woke at 1:30am to find her still wide awake. I put her in our bed where she laughed and kicked us until she finally drifted off to sleep. But when she woke up this morning the tide had changed. She woke crying and has cried every waking moment since. Poor thing she's just completely and totally miserable. She threw up a few times this morning...a lot of foam mainly (so I decided to give her some periactin and now she hasn't peed all day). With all the chaos, I was having second thoughts about going in for her nephrology appt today but we went anyway...thankfully she slept most of the time. We waited in the waiting room for what seemed like eternity (especially considering we were in a super rush to get back home for our yearly Medically Dependent Children's Program review). Finally we saw the doctor, who turned out to be very nice and had gone over Reagan's records and already spoken with the Mitochondrial doctor in advance. Unfortunately he wanted blood and urine and we had no time to give it to him. It looks like we'll be going back in tomorrow. He said based on previous lab results, Reagan's kidney function appears to be fine. He thinks the issues we've been dealing with need to be addressed instead by a urologist. So time to make another appt. As I raced home from the doctor's appt with Reagan screaming in the back seat, I got to thinking. The last time she did this was when she had strep. And just last Thursday her pediatrician said her throat was super red. I really think she has strep again (or it never completely resolved in the first place). The last time she got irate and cried for days and we also saw her getting really gaggy (I guess because her throat hurts). It all makes sense (and now I'm wondering if I have it because my throat is hurting too). So I called the pediatrician and she agreed to just call in some antibiotics so we could get Reagan started on them today instead of waiting til tomorrow (although now a strep test tomorrow will not be accurate). Who cares...I just want relief for her NOW! Poor, poor thing. She's literally slept most of the day and when she was awake she was inconsolable. At least she's finally getting some rest. With that little body of hers going nonstop with those movements and then not taking naps or sleeping at night...she's got to be worn out! Today we also increased her vitamin supplements. After our appt with the mitochondrial doctor, she recalculated the amounts of vitamins Reagan should be taking and increased most of them. She went from 240ml/day L-carnitine to 500ml 3x day...a substantial increase. The CoQ10 went from 120mg/day to 50mg 3x day. The B2 went from 50mg/day to 100mg/day. We're also supposed to add 5g of Folic Acid but I haven't picked that one up yet. That's a lot of stuff! I really feel like I'm giving her medicine nonstop all day long. Thank goodness I have a helper, otherwise I don't know how I'd do it. She really has been a Godsend to me. She's great with Reagan and works on all of her therapies with her and gives me some time during the day to handle the management of Reagan's care, because it really is a full time job. Tonight we spotted some granulation tissue around Reagan's gj-button. I really thought we were in the clear with that, but no, that's definitely what we're dealing with. It looked as if it had been pulled too hard and tissue that was inside is now outside (all red and yucky)...but apparently that's exactly what it looks like. Yuck. Please say some prayers that the antibiotic kicks in and Reagan starts feeling better ASAP (and that we all get some rest tonight). Not too much to post. Reagan has been really tense all day. We got off to a rough start again this morning when I got up to go to the bathroom and looked at the monitor. I saw some movement so I went into Reagan's room to see her with eyes half open and arms twitching a little. It really worried me...looked very much like a seizure. But when I grabbed her arms and tried to wake her, she quickly snapped out of it and started crying (like I scared the you-know-what out of her). If it were a seizure, I don't think I would be able to snap her out of it, but who knows. So stressful. I put her in bed with us but she was very upset and tense. Lots of movement today, especially in her legs. Typically we see the chorea movements mainly in her upper body but today her legs were moving up a storm. Her feet were super cold and clammy again...to the point where her socks actually get damp from the sweat (but her feet stay ice cold). Not many giggles (I have a video from yesterday that I'll have to post at some point because it's just too cute). Today she just seemed uncomfortable...on edge. Like she didn't feel well. And very gaggy. I drained a lot of fluid out of her tummy this morning. We've actually seen an increase in the amount of fluid draining out of her tummy the last few days. I'm not sure what that's about. Maybe she's getting sick and things just aren't working the way they should. Please keep her in your prayers. She needs a break. Reagan has been quite crazy today. It started off this morning at 5am when Mike got up to get a drink of water, he stopped by Reagan's room to check on her and there she was eyes wide open staring right back at him. As soon as she saw him (and it's a miracle she could see him in a dark room anyway), she went crazy yelling at the top of her lungs. I nearly jumped out of bed! He picked her up and put her in bed with us but she never went back to sleep. She was very tense, doing almost the nonstop chorea movements all morning. Lots of crying out...we still aren't quite sure what that's about. Even though it sounds like she's upset, we're thinking it's more of a means of communication (see second video). She does it a lot when you get in her line of sight or pick her up. This afternoon the crying out was replaced by laughing. I have to admit, I prefer the laughing. And although she was doing it a lot, a lot a lot, most of the time it was in response to something we were doing and very appropriate (and oh so cute). She did have one mishap and threw up some foam tonight, while Grandma was babysitting so Mike and I could go out for dinner for the first time in months. Today was day one at the correct dose of risperidone (0.125mg 2x/day). It may take a little while to work, but hopefully we'll see some improvement in the movements. I'm just hoping she'll be able to go to sleep tonight because she's been going strong all day long and I'm yet to see the slightest hint of sleepiness in her. Things have changed a little compared to the last couple days. It all started last night...Reagan started back up with the chorea-like movements. It was difficult for her to fall asleep. I watched her on the video monitor and she'd be asleep and then one minute later, she'd be awake again and moving her head back and forth. This happened many, many times. Hopefully she eventually went to sleep and stayed asleep. She woke up this morning wide eyed and tense. No smiles or laughter today. This afternoon we saw some of the more mild "episodes" so I definitely think the chorea is on the rise again. It's weird how it tapered off and now it seems to be coming back again. We went ahead and gave her a dose of the risperidone this afternoon, but so far we haven't seen any effect (we were told it could take days). She's been doing this horrible crying out thing off and on, she does it when she has an episode but also when you startle her or try to move her or pick her up, which is quite disturbing. She's also become very sensitive again, just the slightest movement or air in her face will cause her to startle. The ice cold feet are back too and she's been gnashing her teeth together all day long. I have no clue what's going on! Her tummy has been full of air again so we've kept her vented nearly all day (she's definitely had more fluid drain out today, some of it green bile). Venting it is the right way to go though, she's been so nauseous lately I'm afraid that anything in her tummy would make her throw up. Since stopping the Periactin we've certainly seen an increase in wet diapers, although there's no doubt the nausea has increased as well. We actually have an appt on Monday with the nephrologist so I guess we can discuss that with him to see if he has any suggestions. Many kids with mitochondrial disease have kidney problems, so we were referred to the nephrologist now so we could let him know about the pee issues she's been having and to get everything checked out. Please keep Reagan in your prayers...I'm afraid it's going to be an interesting weekend. I'm posting these so Reagan's neurologist can see what's been going on (first video Friday, second Saturday). Reagan still isn't feeling quite right. She took a few naps today and was just all around lethargic. Although when she was awake she was in good spirits. We went in and had 7 tubes of blood drawn and she actually was laughing with the needle in her arm! She's a crazy one alright. Beforehand we did make a quick stop at the pediatrician's office. She looked in her ears and looked in her throat. Her throat was very red, so she took another swab to check for strep throat. It was negative this time. She thinks it may just be some sort of virus...she said they are seeing a lot of that right now. Tonight Reagan seems to be feeling even worse. She was very restless...doing the chorea sort of movements for most of the night. She also got the cold sweats and was very gaggy just before bedtime. Her tummy has been very gurgly all day today. Every time we vented her stomach, tons of air would come out (and some foam)...it's usually the other way around. I'm not sure what's going on. She could definitely use some prayers though. Reagan slept well last night. I laid her in bed around midnight and for once she fell asleep almost immediately. Then she slept through the night and didn't wake up til around 10:45am this morning (with my help)! She seemed in good spirits (albeit a little gaggy) but started getting fussy a couple hours later. She fussed and whined for a while until she took a little catnap and then woke up in a better mood. The good mood came just in time for her 3pm therapy appt. She handled that like a pro and then I was playing with her and she was giggling away...next thing I know she's looking sleepy again. A few minutes later she was out! Then she woke up for an hour or so and then fell back asleep! This is not like her. She rarely ever takes naps any more, much less three! I sure hope she's not getting sick. I just hate going to Texas Children's...you never know what you're going to pick up (even just for a routine blood draw). Speaking of, we got the lab results back and everything looks fine. Her pediatrician did a electrolyte panel (because of her previous problems with acidosis) and a thyroid test (because of the cold clammy hands and feet). We were also supposed to have blood taken for the genetic tests the mitochondrial specialist had ordered, but we were informed that it was just too much blood to take all at once. We'll have to go back in tomorrow or Friday to do that blood draw. Ugh. Poor thing. What's interesting are the two tests she is requesting. One is a test for Hexamidase A & B. Never heard of it, me either until I looked it up and saw what it's really looking for...Tay-Sachs disease. Why didn't the doctor just say that? And why would she look for that, since it's primarily found in the Jewish population. I looked it up and as it turns out the other biggest carrier...Cajuns! Well, Mike and I both have Cajun blood, so that makes a little more sense. The other test she called DLD. I get home and look that one up and it's Maple Syrup Urine Disease. Still not sure why she purposely used terms we wouldn't understand. This one is also more common in the Jewish population...strange because we're not aware of any Jewish heritage in our families. Anyway, neither one of those have anything good about them, so hopefully they both come back with nothing. Please continue to keep all of this in your prayers. I'm hoping we'll get some sleep tonight. Right now it's 11:20pm and Reagan is bright eyed and laughing up a storm! And why not...she's had three naps today! Reagan was up late again last night but at least she didn't fuss. She just laid there in her bed wide awake. It was at least an hour or so with her laying there before I saw a yawn. I fell asleep before she did so who knows when she actually fell asleep. The diaper situation is still the same. She usually has a wet diaper when she wakes up in the morning and that's about it (unless I give her lasix). She's been off the periactin for two days and so far not so good. She threw up this afternoon. Ugh...there goes our longest throw up free streak (11 days)! I do think the switch over to a gj tube has been instrumental in this, but at the same time the periactin might have also been playing an important role. It does seem that she's been more gaggy since taking her off of it. I guess we'll just have to wait and see what happens over the next few days. If we can get her back to having regular wet diapers, then at least we know it was the medication causing the problems. If not, then we're in trouble. We don't have an appt with the nephrologist for another 3 weeks (but I'm hoping to get it moved up). I've actually been on the phone with doctors offices what seems like all day today. I think we finally have everything straightened out with the risperidone (although I'm yet to pick it up from the pharmacy, so I'll believe it when I see it). I did get chewed out by the clinic coordinator though for calling the doctor on call. I made one call Friday night to try to clarify this mess so we could get her started on this new medication...but I guess that was too much. Apparently I'm not "allowed" to call after hours about medications or refills. According to her, Reagan could have gone (and did go) another 4 days with chorea. Let's just say that I was not happy being reprimanded and spoken to like a child and I let her know. What a nice way to be welcomed to the practice. Not very reassuring, that's for sure. On a good note, the chorea movements have lessened and we're not seeing any of the disturbing "episodes" anymore, just the occasional every day movements that we've always seen with Reagan. I'm torn about starting the medicine now or waiting til we see a worsening again. She's just on so many medications right now. I guess I'll ask her neurologist about it tomorrow (I left a message for him today, so hopefully I'll get a call back tomorrow). I'm curious to see what he thinks about this medication, considering it wasn't in the list of 4 medications he mentioned to treat chorea. Lots of doctors, lots of opinions. Although in this case I do think the mitochondrial doctor knows how to best treat chorea in mitochondrial patients. We'll see. Last night Reagan did not want to go to bed and I thought maybe her full bladder was part of the problem. So I went ahead and used the Lasix again and in less than 10 minutes, we had a wet diaper (and a dirty diaper at that). Of course that didn't help getting her to sleep...she fought me and fought me...and then finally fell asleep next to her daddy. Of course the little bugger slept in super late, she also woke with a wet diaper but that was the only one all day. I spoke to her pediatrician about it this morning and she agrees that we need to just stop the periactin to see if the bladder issues improve (hopefully the nausea won't come back). In the meantime, she wants us to use the lasix once a day to try to get her back on schedule. Apparently she was the only doctor that worked today because tried unsuccessfully to get a hold of the mitochondrial specialist, Reagan's neurologist, and the nephrologist...all apparently out of the office for MLK day. Slightly irritating. Tomorrow we're going to go in for some blood work the mitochondrial specialist requested (which we wisely decided not to do after hours on Friday). Hopefully we'll get our favorite phlebotomist because I think they'll have to take several tubes full. Reagan's such a pro now at giving blood...rarely does she shed a tear and sometimes she even laughs. Speaking of laughing, she's been all giggles again today. It's so darn cute. I'm going to have to get it on video. It's like she just cracks herself up (gas especially gives her the giggles). So funny. Not much to report today. Reagan slept well but woke very upset this morning when she accidentally hit Elmo's hand and Elmo said "Elmo loves you" very loudly. I guess it scared her because she was in full out tears by the time I got to her. Other than that slight mishap, she's been in a great mood all day today. She woke with a very wet diaper but nothing since then (and she's got quite the bulging tummy right now). I'll give her til morning and if she doesn't produce, I guess we'll have to use the lasix again. I hope it doesn't come to that. Grandma flew in today and that made for a very happy baby (and Grandma). Reagan was laughing up a storm for her. The laughing, while so extremely cute, is worrisome at times. Most of the time she does it in response to something you do or a noise you make, but sometimes (like last night) she just goes off and won't stop laughing. And it's this crazed sort of laughing. That worries me. I guess you never really stop worrying about things that could potentially be seizures. New doctor and new med? Mike's home. Reagan slept well last night. All is good. Well, except for the fact that Reagan woke up this morning without a wet diaper. That made it ~36hrs without a wet diaper. I called her pediatrician who immediately prescribed Lasix. Within 10 min of taking it, Reagan had a wet diaper! Whew! Thank goodness! I was thinking she might pop! She had 25oz of formula yesterday and not a single wet diaper. We stopped the periactin at least for today (the medicine for cyclic vomiting syndrome that has the side effect of urine retention). This morning she was still doing a lot of the choreoathetosis movements...less of the "episodes", more just kind of nonstop movement. I don't like that. I don't like any of it. Today we met the mitochondrial doctor. She reviewed Reagan's muscle biopsy results and said that there's no doubt she has mitochondrial disorder (and to her it looked like there were defects in a few of the complexes not just complex I). She recommended a few blood tests just to rule out a few genetic disorders that can be linked to mitochondrial disorder. 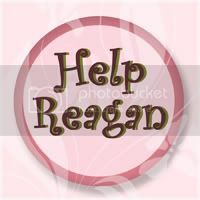 She wants Reagan to see another GI doctor (who sees her other mitochondrial patients), a nephrologist (to check Reagan's kidneys out and make sure all of these bladder issues she's having aren't anything more serious), she wants her to have an ECHO/EKG, and another MRI. She also seemed concerned about the chorea (although she didn't even see the episodes because I forgot the video camera) and she seemed very sure of the medication she wants to put her on. Risperidone...it's something she says always works for her mitochondrial patients that have chorea. She said Sinemet would make it worse and made a face when I mentioned Xenazine. So risperidone it is. Not sure when we'll actually start it though, because the pharmacy is having some issues and they are unable to reach our doctor to clear it up and the doctor on call doesn't feel comfortable in addressing it (what's the point of having an on call doctor then?). His concern is it does have the potential to lower seizure threshold, but then again so does just about anything else they would prescribe for chorea. I don't know. It's frustrating. It's looking like this won't be resolved til Monday. Please keep it in your prayers that everything goes smoothly until then and that this med does the trick. I spoke to two neurologists today and both of them think that the movements are choreoathetosis. Of course, this is only an opinion. And while it's good that they don't think they are seizures, we still don't have a real plan of action as far as treating them. Supposedly benzodiazipenes (like Klonopin and Clobazam) are the first line of treatment for these types of movements. There are other medications but they all hold the possible side effect of causing seizures. Unfortunately, the benzos don't seem to be helping so I'm sure at some point we'll have to try something else, but for now we're just going up on the Clobazam. I'm really glad that we were able to get in tomorrow for an appt with Reagan's Physical Medicine and Rehabilitation (PM&R) doctor, she specializes in movement issues so I'm hoping she'll have some good suggestions. I plan on taking the video with us. Then Friday we have the appt with the Mitochondrial specialist, so maybe we'll get some good input from her as well. This morning the movements were frequent...way too frequent. But they tapered off and I've only seen her do one all afternoon. She's been in another great mood today. Tons of laughing. It makes everyone laugh. It's so nice to see her happy...even if we're not really sure why she's laughing so much...it's so darn cute! Please continue to keep her in your prayers she certainly needs them and keep Mike in your prayers as well...he'll be traveling all day tomorrow and should be exhausted by the time he gets in tomorrow night! Last night was a long one and it really wasn't Reagan's fault. It was mine. Every single noise I heard, whether a cough or a bubble from the humidifier, I was up looking at the video monitor or running to her room to check on her. All night long. I feel like I didn't sleep a wink. I'm sure it was the idea that these "episodes" we've been seeing could possibly be seizures. First thing this morning I was on the phone leaving messages for her pediatrician and her neurologist. Unfortunately no one has any real answers. Her pediatrician told me that it does concern her and maybe we need to think about doing another 24hr EEG (although she is by no means an epileptologist). Then the nurse from the epilepsy clinic called me back to say that she spoke with our neurologist and he thinks it's all related back to the chorea-like movements she's been having. He calls it choreoathetosis. I don't know. Maybe that's it. She's done it quite a few times today...throughout the day. I tried to video it, but again I always seem to miss the first part of it. The only thing that really worries me is that you can't snap her out of it (similar to a seizure). Who knows. Maybe we'll get some more input on Friday when we meet with a new doctor, the Mitochondrial specialist (who is also a neurologist). I decided to go ahead and just start weaning the Klonopin and I also increased the Clobazam back up to where it used to be (since her doctor didn't really want her on both meds to begin with). Hopefully things will calm down a little. If not, then we'll probably increase the Clobazam further. Other than the "episodes", Reagan has been great today. This afternoon she started up with the laughing and she's just been so funny! I think my dad got a big kick out of it...I don't think he's ever seen her so giggly. She's been super spitty today (the foamy spit). I guess it started last night because yesterday during the day she was not spitty at all. What's interesting is the majority of stuff that was draining out of her stomach today was white FOAM. That can't be good for an upset stomach! Tonight she started back up with the crazy tongue movements. Her doctor thinks that's linked back to all of the other movements she's doing. I sure hope we can find something to help because the tongue hanging out of her mouth drives me crazy!!! She could give Gene Simmons a run for his money. It's crazy...I'm afraid she's going to gag on her own tongue! Never a dull moment. We could use some dull moments. Right now I'd settle for some sleep. Hopefully my little one will cooperate. Reagan slept well again last night. She's been a little spitty today...although I think she's swallowing most of it. I drained a ton of foam out of her tummy today. Her little feet and hands have been really cool and clammy. I'm not sure what that's all about. I've been trying to warm them up to no avail. I spoke to her neurologist today about the whole Klonopin/Clobazam situation. He said it's probably not a good idea to keep her on both long term, but we could leave it alone for now if she seems to be doing well. And she does. She's sleeping at night. She's more relaxed and less tense during the day...both her feeding therapist and OT commented today on how glad they were to see her with less tone (and that she's actually doing better than they would have expected). So all would seem good right? Not so much. I saw something tonight that concerns me. I actually have seen her do it a few times the last couple nights but it didn't really hit home until tonight when she did it (she actually did it twice a couple of hours apart). It's very similar to the crazy movements she's been doing only it comes on very suddenly...her eyes get huge, her nostrils flare, she starts breathing heavy and starts turning her head back and forth. Every time I've seen it, it's been at night. I'm afraid it might be a seizure. It's not like any seizure I've ever seen her have...but I'm afraid it might be some new type. I hate to say that, but I'm really worried about it. I'm also worried that she might be doing it at night while she lies in bed. Ugh. We really don't need this. I pray it's nothing. I pray it's just some crazy movement. I pray it's something that just passes and we never see again. But I don't like it. Not one bit. And I ask that everyone would please keep her in your prayers because she does not need this. She's been through enough. ENOUGH. Seriously. And maybe we just need to take away the Klonopin. Maybe we need to increase the Clobazam instead? I don't know. Whatever it is, I just want it fixed. **I'm trying to get it on video...problem is, it starts off so suddenly by the time I get the camera ready, I miss the initial onset of it. I'll keep trying! Last night was another good one with Reagan sleeping through once again. Maybe the Klonopin/Clobazam combination is a good one. I'm just glad we're all getting some sleep again. Mike should be in China soon. I'm sure I'll get a call in the middle of the night to let me know he's landed. Not a fun flight. Reagan's been pretty sweet and smiley today although she did have a few teary eyed moments where she was about to cry but we never really figured out why. No real naps today. She fell asleep for a short while but the second I tried to lay her down, that was it. We've been dealing with some seriously chapped crackly lips lately. I think it's a combination of her being tube fed and constantly running the heat (which dries out our usually super humid air). We've been putting lip balm on her nonstop but that doesn't really do the trick. We bought a cold mist humidifier but it leaked water every night and had something growing in it after only a couple of days of use. Last night I ran out and bought the warm mist humidifier and it seemed to work a little better (and it didn't cool the room like the other one did). Hopefully that will give her little lips some relief. Tomorrow I think we might give feeding therapy a try. It's been months since she's had any therapies, so this should be interesting (especially since it's "feeding" therapy). We definitely need to her back into the groove of things...it would be nice to reach some sort of normal again. This morning we woke up in disbelief...it was 9:30am and Reagan was still asleep...and so were we! Talk about nice. We got kind of a late start on medicines but that's OK. Reagan woke up for a little while and then fell back to sleep laying with her toy next to the fire. I'm just glad to see her getting some rest. I know it's a little extreme, but it still must be good for her. Mike leaves tomorrow morning at 3:30am to head to the airport for his trip to China (the one he was supposed to take in December but postponed because Reagan was in the hospital). He comes back Thursday night. Thankfully I'll have plenty of help with my mom here today and tomorrow and my dad coming in on Monday. Please keep Mike in your prayers for a safe trip and keep Reagan in your prayers that everything remains drama free while he's gone. We could all use some drama free days! **Oops, I guess I spoke too soon. She threw up quite a bit later on. Mainly clear fluid...it can't all be spit can it? Poor girl. I sure hope she can sleep tonight. Reagan was up again all night last night. Still laughing. Poor thing...she's just got to be exhausted! I put her in bed with us around 5:30ish and by 6am she was asleep. She woke up at 8 with a yuck dirty diaper (the antibiotic she's on turns her poop red...probably too much information) and then she was back out. She slept all the way to TX Children's and didn't wake up until we were in with the GI doc and she tried to shove a tongue depressor in her mouth. Reagan was NOT a happy camper. I'm so glad that she was able to get some rest though. And it was a good rest...she was totally limp. Not much to say about the GI appt. She wants us to come back in 1 month so she can check to see if Reagan is gaining some of her weight back. Poor thing, she's just skin and bones right now. We went from there to the neurology clinic. Her neurologist wasn't "in clinic" today but agreed to meet us to try to come up with some sort of game plan. He thinks we need to add back the Clobazam. Even though Clobazam and Klonopin are from the same family (both benzodiazepines) they still work through different receptors, so maybe taking away the Clobazam has further aggravated things. Who knows. He said that it's possible the higher doses of Klonopin are over stimulating her and keeping her awake, definitely the opposite of what you would think with Klonopin but sometimes kids with neurological issues just don't respond the way you would think. He also said we could just try going up higher on the Clobazam and maybe do away with the Klonopin (since Klonopin is such a nasty drug). We'll see. I added back the Clobazam tonight and lowered the Klonopin a little. I'm supposed to call him back tomorrow to let him know how she's doing. We also had her CBC and electrolytes checked while we were there, so I'll be interested in hearing how those looked. Overall I'd say she's doing better today. Still lots of body movements but the tongue has calmed down and it's been replaced by grinding of the teeth. Hey, whatever it takes to get her mouth closed. She's still laughing a lot but most of the time it's in response to something (usually a noise) and I have to admit it's so darn cute and way better than crying. Her head control seems improved too and we were able to get her into a good sitting position today. It's probably her tone helping her to straighten up like that but it's sure nice to see her doing some pre-vomiting things. No throw up today...I vented her tummy last night so hopefully that helped. Continued prayers are appreciated. Last night was odd, to say the least. 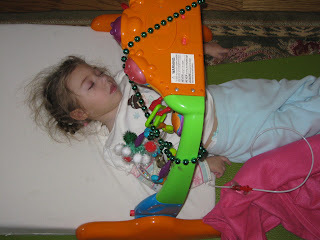 Reagan was not even slightly tired but around midnight we finally just laid her in her bed. And there she laid. Turning her head back and forth (so much so she matted up the whole back of her head), watching her toy and laughing. I woke up several times during the night to the sound of her laughing. I don't really know if she ever fell asleep. This is CRAZY. A kid that doesn't nap all day, should be able to sleep at night...right?!?! Ugh. I don't know what to say. The neurologic quirks we're dealing with right now are almost worse than the seizures themselves. Seriously. I couldn't have ever imagined saying that but I really think it's true. Today Reagan was shaking/trembling, keeping her tongue out of her mouth almost nonstop, and laughing (which I don't mind but it's not a normal laugh...it's a crazy laugh triggered by nearly everything). Tomorrow we're going back to Texas Children's (for a GI appt) and we're going to page our neurologist so he can take a look at Reagan. I spoke to him on the phone today and he thinks we should try going up on the Klonopin (and spreading it out to 3 doses, since it wears off quickly). I'm hoping it will give her some relief. This poor child's body needs to rest! Just watching her doing this nonstop movement wears me out! I'm so stressed right now...I'm seriously on the verge of a nervous breakdown. And if all that wasn't enough, this morning (before we left for her ophthalmology appt) she threw up lots of green bile and foamy spit! Ugh. I spoke to several people about this today (and we're going in to GI tomorrow) but hopefully it was just due to the stress of the placement of the tube yesterday. I'm going to try venting the g part of her button at night while she sleeps...that way if anything is building up into her stomach like bile or even spit, it will just drain out (before it causes her to throw up). Sounds like a good plan, right? I hope it works. Something's just got to start working, right? Something? Anything? Prayers are certainly needed. We can't get enough of those right now. This baby needs some relief! Last night was tough. Reagan would NOT go to sleep...she was so nauseous and her body was in a constant state of movement and nothing was helping. Not even the Klonopin, nothing. Finally around 1:30am I remembered that our pediatrician had prescribed Phenergan suppositories for times when the nausea and vomiting was out of control. I certainly can't think of a more out of control time than yesterday. I gave her the suppository (only half of one) and 10min later she was out. I sure wish I would have thought about that sooner. Now that I think about it, I really think what happened yesterday was Divine intervention. I was dead set on not getting the gj. I wanted to try to work through this and hopefully solve the problem instead of just diverting the symptom. But the horrendous day we faced yesterday made it clear to me that the g button was not going to cut it. So today we went in (with an extremely nauseous child) knowing what we had to do. In the office, they took out the g tube. Reagan was in such a weird, wired mood...she laughed as they pulled it out. I think they thought she was crazy. I was amazed to see how little of it remained beneath the skin. Only about 1.5cm. We were so lucky it didn't get yanked all the way out last week. They put in a foley catheter since they knew we were just going straight down to have it changed out. From there we went to Interventional Radiology where they surprisingly took my baby away to do the procedure. I was not expecting that. Talk about added anxiety. About 30min later (seemed like a long time for such a simple procedure), they brought back my baby who was now sporting a gj-button. I was in a rush to get home and feed her because she'd been without fluids for more than 24hrs but when we got home I realized no one told us how to use this thing! Thankfully I figured it out (with a little help from our online friends). So far so good. She's still very nauseous, doing a lot of the mouth/tongue movements, but I haven't seen any gagging whatsoever since this morning. Oh please...this HAS to work! Please keep this in your prayers...and that she's able to be still and get some rest. So...I thought we were in the clear this morning when Reagan woke up throw up free. Yeah! It seems like she's been doing it lately while she's sleeping. She was sticking her tongue out a little more than I would have liked, but otherwise she seemed OK. She was in less of a Klonopin daze today, so that was encouraging. We did medicines and then she was in her therapy room working with our helper when I heard it go down. I ran into the room where there was no shortage of throw up. I'm not really sure how that works. She's only getting 35ml an hour (I just increased it yesterday)...which is roughly 0.6ml every min. I'm not sure how she ever really has any volume in her stomach to bring up anything to begin with. I know a lot of it is spit because it's all clear and foamy...but fluid is fluid and she's losing it any way you look at it. Granted she's getting a lot more fluid than she was before when she was fed by mouth. The g-tube has really been a God send. Without it we'd still be in the Hospital. Especially today. She's thrown up several times today. Our good day went south really quick. The first was at 12:45pm, the second about 30min after that. I stopped all her feeds and then didn't start them back up til 4pm and by 4:30 she did it again. At that point I just left the pump off. Then tonight while giving her medicine, she did it again...twice. Ugh. I'm not sure how much Nexium and Banzel she even kept down. Hopefully enough to tide her over until tomorrow. As of yesterday I was dead set on not doing the gj-tube tomorrow. But now I'm having more doubts. I think I'll talk it over with her surgeon when we go to have the g-button put in. Maybe he can give me some insight. I'm still hoping the Periactin is going to do the trick, but who really knows til we get her to a full dose. Today was just a lousy day. Lots of prayers needed for this little one...lots. Tomorrow is a big day and decisions need to be made so you may want to say some prayers for me too! Reagan slept in again this morning (waking only for a moment at 5am to throw up). Poor girl. With all the sleeping I decided to forgo her morning dose of Klonopin. She was still really groggy all day, but finally this afternoon she started waking up a little. She's been in such a daze since we started the Klonopin, it doesn't seem to be a good medication for her. If we would have given her the full dose the doctor wanted to give her she'd be sleeping 24/7! With more throw up this morning I went ahead and increased her morning dose of Periactin...but now she's gone all day long today without a wet diaper. Ugh. We just can't win. Tuesday is our appt to have her g-tube switched out to a g-button (mic-key button). We were supposed to go straight from there to Interventional Radiology to have the g-button changed to a gj-button...but I think we're having second thoughts. She's still throwing up, but she did go 6 days without any throw up (the longest yet). We're hoping that increasing the Periactin to the actual prescribed dose might help even more. So I think we're going to wait see how it goes with the g-button and if we have to go back in at some point to have it switched to the gj then so be it. Lots of calls to make tomorrow. Should be fun. Please continue to keep our little one in your prayers. After increasing the Klonopin last night, Reagan slept and slept hard. She didn't wake up this morning until after 10! Then she was awake for an hour or so and fell back asleep where she slept for most of the day. So maybe the Klonopin is a little much for her. While it's good to see her relax and able to rest peacefully, we certainly don't want her sleeping all day long! I don't know if this is something we can work through and just allow her body to get used to it over time, or if we need to move on to something else. First thing Monday I'll be on the phone leaving messages for several doctors so maybe we can come up with a better game plan. I know her PM&R doctor has mentioned before that she wanted to try baclofen to see if it could decrease the extremely high tone Reagan deals with (and I've heard that it's also good for treating dystonia). Maybe that would be a better choice than Klonopin. We'll see. Please continue to keep our little sleeping beauty in your prayers. She sure needs to catch a break. Last night was another rough one. Reagan was up a lot with the chaotic random movements. Constant movement and gnashing of teeth does not make for a good night's sleep. And then around 5:00am she woke throwing up. Ugh. Two days in a row. What's weird is that as soon as she was done throwing up, she smiled and fell asleep. peacefully for the first time all night. Poor thing. It's sad that she has to throw up to feel better. On a good note, she's been in a much better mood today. We even saw lots of smiles...the first time in days. The antibiotic must already be working because this was a drastic improvement compared to the last few days. Now if only we could figure out this whole movement thing. I sent an email to Dr. Chugani and he agrees that switching her back over to Klonopin may help. He wants her on 0.5mg 2x/day which is a pretty high dose considering the highest she's ever been on was 1/4 of that. I'm worried that it might drug her up and make her completely out of it, but sadly at this point that would be a step up from what she's dealing with. Hopefully we can find some middle ground. A good night's sleep would be a good start. Please keep her in your prayers. So here we are...a brand new year. We're hoping for a happier one. Last year was filled with heart ache, sleepless nights, surgeries, hospital stays, seizures, & vomiting. Don't get me wrong, it wasn't all bad. We sold our house, bought a new one that fits our needs and surrounded by wonderful neighbors, saw the first major reduction in seizures ever for Reagan, and saw Reagan seizure free for the first time in 2 years. Those are all really good things...but I want more. I want more for Reagan and I'm hoping this will be her year. Here's to a Happier New Year for everyone!